I know I always say "I LOVE THESE" whenever I make something, but dumplings are for super-duper serious one of my favorite foods. I love them. I could eat them every day. Except that they are very time/labor intensive, and I have yet to find a gluten-free dumpling that is available. I've heard rumors, but haven't seen any in person. 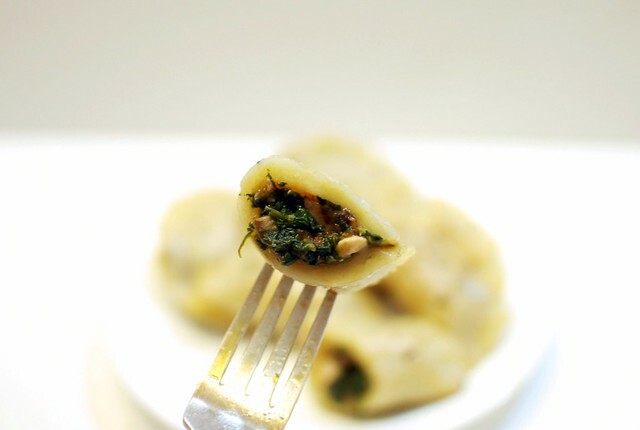 Back when I was eating gluten, but not meat, I used to get these spinach dumplings from the corner Chinese restaurant and I couldn't get enough of them. Then I stopped eating gluten, started eating meat, and stopped being able to eat at corner Chinese restaurants. Boo. So now I make my own! Check it out. 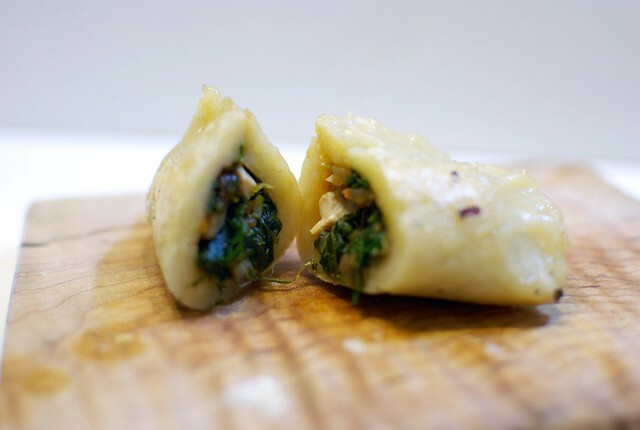 I used the dumpling wrapper recipe I posted two years ago (oh my god), but this time you get a filling recipe! Strip the leaves off the bok choy, then slice into thin strips and set aside. Dice the stem as small as you can. 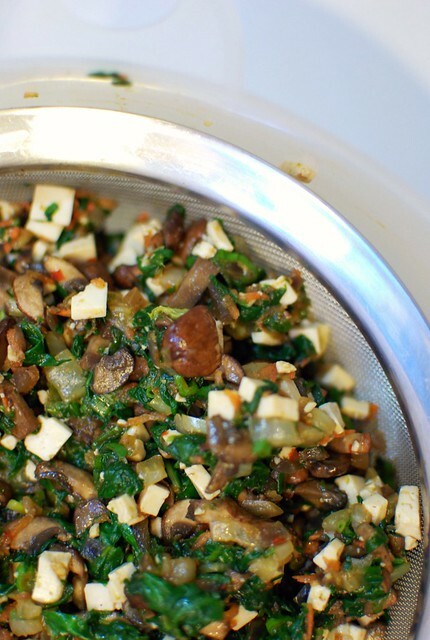 Heat up a pan with a small amount of oil in it, then add the bok choy stems, onion, mushrooms, ginger and garlic. Cook for 10 minutes or so, until softened. Chop up the spinach, toss it into the cooked vegetables with the bok choy leaves and let everything wilt for a second. Remove from the heat. Add the tofu and carrots, as well as the soy sauce, chili garlic sauce, and sesame oil. Let everything sit for about half an hour, until cool, then toss everything into a strainer and let drip for a while. You want your dumpling filling to be pretty dry so it doesn't make the wrappers go all floppy and fall apart. Pinch off a ball of dough, a little smaller than a golf ball, and flatten in your palm. Place about a teaspoon of filling in the middle, fold the dough in half, and pinch all around the edges to seal in. Repeat about a billion times. Wish six times the dough recipe, I made about three and a half dozen dumplings. They were pretty large though. Line the dumplings on a cookie sheet to freeze whatever you're not going to eat now. To cook the dumplings, bring a few inches of water to boil in your wok. Put a bunch of dumplings in your bamboo steamer, put the lid on, and put the steamer in the wok over the boiling water. Cook for 15 minutes (make sure to check the water once in a while to make sure it's not boiled all out and ruined your pan). Pan fry the cooked dumplings to get a little crispy shell on the outside, and serve with dipping sauce. *This makes a lot of filling, so I made six times what the recipe says so I could make as many dumplings as I could. Then I got bored with making dumplings and used the rest of the filling for something else, which you will see tomorrow. these look great! i can't wait to give them a try. i used to love dumplings before i was gluten-free. thanks for the great idea.